Today, the lines between communications services such as telephones; video services such as cable TV; and information services such as Internet connectivity, are blurring. But during the last quarter of 2007 AllCom plans to introduce a new technology suite, the GeniePhone, which will melt those lines of division like snow in the desert. A local, end-user processing device, the GeniePhone will move the Universal Office from a host-based service offering to a truly global distributed processing system capable of extending its services to literally any location in the world where the Internet is accessible. 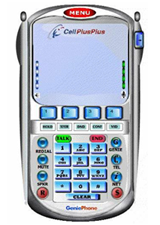 The GeniePhone device will connect to your local computer network, whether at home or at work, to coordinate all of your communications with AllCom�s central system, AND with its fellow GeniePhone devices worldwide. With the GeniePhone, you and AllCom will have the world�s first truly global, truly distributed communications network.